OK, then. With the release of Windows 10 Version 1803 (April Update) HomeGroup is gone, gone, gone. I’m not sorry to see HomeGroups disappear, because it was an enormous pain to kill off an old HomeGroup to create a new one. But I didn’t realize it had been supporting some networking capability on my LAN. With HomeGroup’s demise, all my local PCs disappeared from the Network pane in File Explorer. And that’s why I had to figure out how to bring back basic Win10 1803 networking. As it turns out, it’s not at all difficult. But it does require two steps to get there. At least, that’s how it worked on my LAN anyway. Note: if you never used HomeGroups, none of these contortions should be needed. HomeGroup doesn’t need network discovery to find other nodes on a LAN. One of its few pluses was that it used the IPv6 Neighbor Discovery protocol to figure out who (or what) is “out there” on a local network. But with HomeGroup now MIA, Windows networking works best if Network Discovery is turned back on. 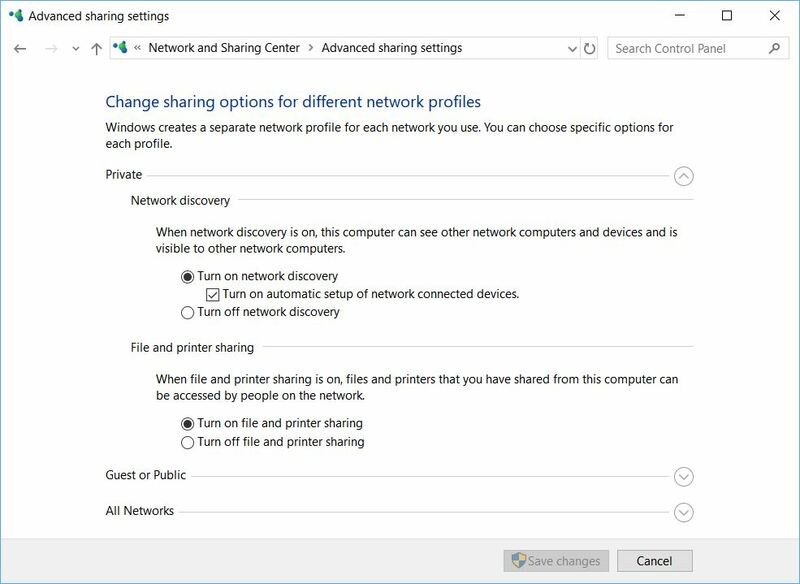 Open the Network and Sharing Center, click “Change advanced sharing settings,” and be sure the radio button for “Turn on network discovery” is selected under the Private network heading (you can, and probably should, leave it in the “off” position for Guest or Public networks, though). With no HomeGroup, you need Network Discovery turned on for private/local networks to make computers visible in File Explorer (and elsewhere). [Click image for full-sized view.] I turn off file and printer sharing because all my printers are networked. 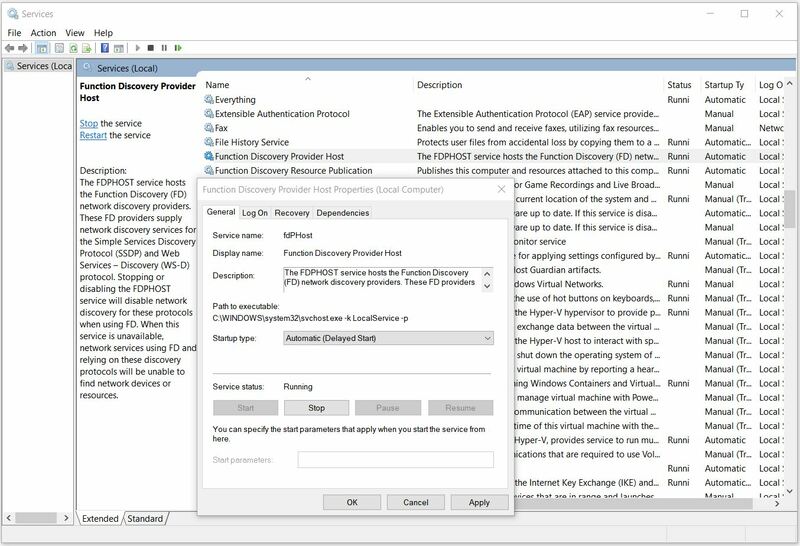 The two Windows services that support Network Discovery are Function Discovery Provider Host and Function Discovery Resource Publication. By default in Version 1803, they’re set to Manual startup. That needs to be changed to “Automatic (Delayed Start)” for things to work properly in File Explorer (and elsewhere in Windows 10). Otherwise, you won’t see local computers on the network under the Network heading there. Click Properties for each of the two Function Discovery services, then change its startup type as shown. [Click image for full-sized view. What’s in a Network Map? I like to see the computers on my LAN in File Explorer. This also lets me navigate into them, and access the files to which my account gives me access. If you follow the two simple steps I’ve outlined here and use a Workgroup (not Domain) based Windows 10 network, you should be able to see (and do) likewise. Enjoy!